Whether you’ve given birth to one baby or twins or multiples, our safer sleep advice still applies. Follow our tips on safer sleep for twins or multiples. place them on a firm, flat and waterproof mattress in a good condition. But what about sharing my bed with my babies? Firstly, the safest place for your baby will always be in their own separate cot or Moses basket. And they should sleep in the same room as you for the first six months. Co-sleeping can be risky and increase the chances of Sudden Infant Death Syndrome (SIDS) if your babies were born prematurely or at a low birth weight (which can be common in twins or multiples). Avoid bed-sharing if you or your partner smoke or have drunk alcohol. You should also avoid bed sharing if you have taken drugs or any kind of medication that can make you feel drowsy. 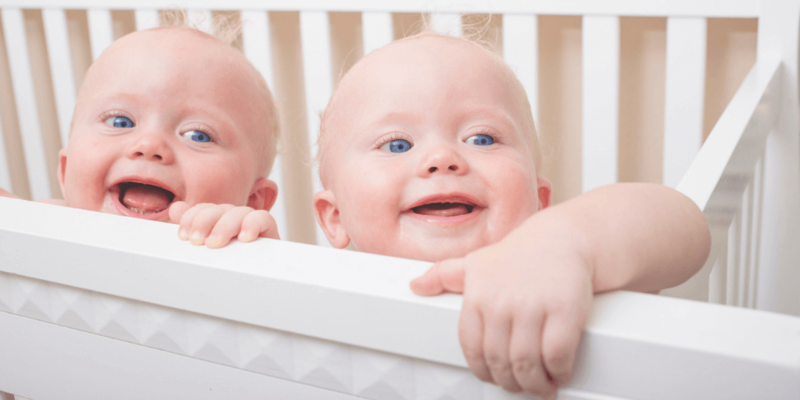 Should my twins be sharing the same sleep space? In hospital, premature or low birth-weight twins are often slept close together to mimic the conditions within the womb. And this may also improve the development of their vital functions. However, you should only place them side-by-side in a cot in the early weeks, when they can’t roll over or onto each other. Make sure they are not close enough to touch and potentially obstruct each other’s breathing. Even with small babies a Moses basket is too small for two or more babies to sleep safely. If space is tight and you can’t have two cots in the same room as you, or can’t afford two. You can place both babies in the same cot at opposite ends of the cot in the ‘feet to foot’ position. Just ensure that you are in the same room as them up to 6 months old. Sharing a room with your babies is a really important measure you can take to reduce the chance of SIDS. I’m sleeping my twins in separate cots and separate rooms, how can I make this work? Ideally, parents should share the same room as their baby for the first six months. If you don’t have the space to have both twins in the bedroom with you, you may need to make the advice work for you. If you have a sofa bed you may need to relocate to your living room. Or you could move to another larger room in your home for six months. Or, if you have a partner, you may need to make new sleeping arrangements for a while. Try out each of you sleeping in a different room with one of the twins until they are a little older. If you have any questions or queries about safer sleep for twins or multiples or safer sleep advice please feel free to get in touch at info@littlelullaby.org.uk or visit our safer sleep for babies advice pages. For more information about twins or multiples, visit the TAMBA website or download The Lullaby Trust’s fact sheet on safer sleep for twins.